* Certain colors ( especially yellow, orange and red) may require additional coats to achieve adequate hiding, particularly when applied over dark or contrasting primer colors. Yellow, red, and other bright colors will typically fade faster than other colors due to the replacement of lead-based pigments with lead-free pigments in these colors. Steel – Abrasive blast to SSPC SP-6 or higher with a 1.0-3.0 mil surface profile. ventilation during application and curing. Provide shelter to prevent wind from affecting spray patterns. trap in the main line is essential. Product is sensitive to moisture contamination. Brush & roll – Use a high quality natural bristle brush and / or solvent resistant, 1/4″ or 3/8″ nap roller.Ensure brush / roller is well loaded to avoid air entrainment. Multiple coats may be necessary to achieve adequate film build. Amercoat 851 flow control additive can be used to for enhanced flow and leveling with brush and roll application. (use of 851 additive at greater than 2.5 oz/gal will increase the VOC to > 100 g/L.) Multiple coats may be required to achieve proper film build and hiding with roller application. 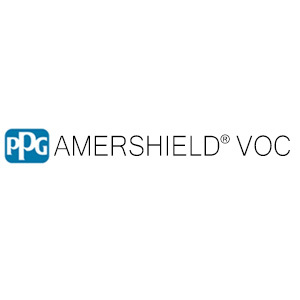 PPG Protective & Marine Coatings has no control over either the quality or condition of the substrate, or the many factors affecting the use and application of the product. PPG Protective & Marine Coatings does therefore not accept any liability arising from loss, injury or damage resulting from such use or the contents of this data sheet (unless there are written stating otherwise). The data contained herein are liable to modification as a result of practical experience and continuous product development.This data sheet replaces and annuls all previous issues and it is therefore the user’s responsibility to ensure that this sheet is current prior to using the product. The current data sheets are maintained at www.ppgpmc.com The English text of this document shall prevail over any translation thereof.